Are you looking for a dental treatment to enhance your smile? You may be wondering about Invisalign® clear aligners. Our Mount Pearl Dentists explain what Invisalign® is and how it works. 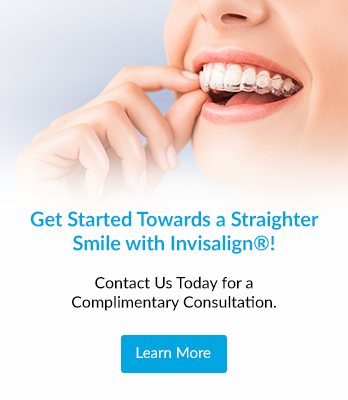 Invisalign® is a series of custom-made clear aligners (or trays) that help shift your teeth into a desired position. They are easy to use, comfortable and nearly invisible. For this reason, Invisalign® is a good choice for people with aesthetic concerns. The aligners can be used to help correct a variety of misalignment issues such as gaps between your teeth, crowding of teeth, overbites and underbites. A consultation with your dentist will help you both determine if Invisalign® is the right treatment option for you. If it is, treatment can begin. Invisalign® treatment will gently straighten your teeth over a period of months or years. First, your dentist will take an impression of your teeth. Using the dental impression, Invisalign® technicians will then create your set of custom aligners. Invisalign® aligners work by applying consistent, gentle pressure which moves to your teeth into their new positions. Instead of moving them all at once, each phase of your treatment will focus on a few of your teeth at a time. This means that you will switch aligners about once every two weeks. This way, each of your teeth will get exactly the right amount of pressure for the right amount of time. The total number of aligners in your series will depend on the nature of your misalignment. Before beginning, your dentist will evaluate your treatment needs and give you an estimate for how long it will likely take. If you have more questions about Invisalign®, please contact our Mount Pearl Dentists today to book a consultation.